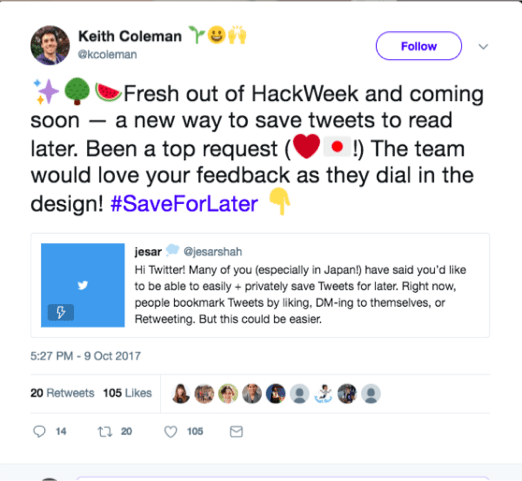 Years later after Facebook launched the “Save for later” button, we find out that Twitter is launching a bookmark tool very soon. Since now, users that wanted to save a tweet usually liked it, DMed it to themselves or retweeted it. This will also delimit the interaction between users and users and businesses. Because liking a post just to save it for later could mean much more to the businesses. The news has been reinforced by the product manager of Twitter, Jesar Shah, saying that they would listen to the users’ requests in order to introduce this new Twitter feature. A prototype of the new feature has been build during the Hackweek and it shows it under the “More” menu – the three dots – where you can find the “Add to later” button. Until it gets released to the large public, this will be the new design of the app, but, of course, after studying more this aspect with beta users, the design might also change. With the new feature, Twitter shows the importance of the community’s input regarding new features they would like to see. It was the same with the mention feature and the retweet one as well. Hearing users’ needs they transformed them into real features in order to improve the experience. One of the latest product development features, like the reply format – which made it possible not to count the @reply characters when sending a tweet – was more of an engineering process related to the 140 character limit than listening to the users. On contrary, when it came to changing the character limit to 280 it was more about listening to the feedback they got from users almost all over the world. It is not yet known when Twitter will start beta testing the new feature and who will be the lucky ones involved in the process, but it seems they are in an advanced developing process, saying they will launch the feature soon. If you want to see more updates on the process, just follow on Twitter PM Jesar Shah and product designer Tina Koyama, who is said that will start tweeting on the process. 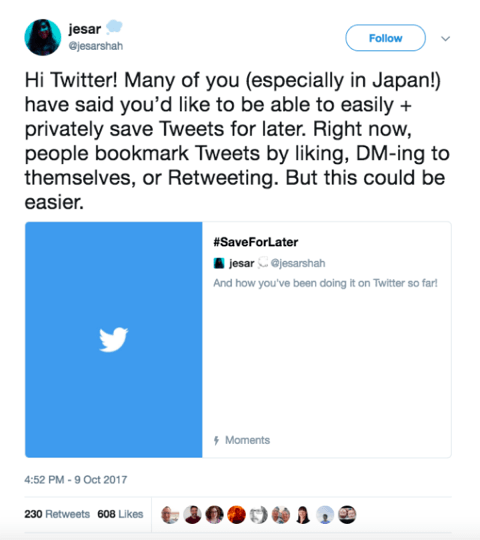 If you want more updates or have an opinion on how this feature could integrate with the platform and the app, you can just either follow or write tweets with the hashtag #SaveForLater. Are you excited that Twitter is launching a bookmark tool? Do you think it is a belated copycat or something useful that you will use in the future?